Ask fellow campers about "Barren River State Resort Park" and nearby attractions. 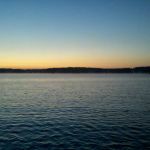 I stayed here because it was my closest alternative when I found out that all sites at Baileys Point COE were full. Boy was this a compromise! This was one of the worst places I have ever stayed. Even after using all of my leveling blocks, the RV still listed to the rear. The water hookup was so far away from the site - on the 'wrong' side - that I didn't even bother to hook up the water line. We camped at Barren River State Resort Park in a Motorhome. Lots of room at the sites. Some sites would be difficult to level a large rig or to pull into as some have steep slopes in or out of site. Recommend driving around the park first to see where your rig will work then go back to gate to pay and mark your site. Plenty of shade trees. Decent bathrooms. Shower water pressure good. Tidy state park, well maintained. Great value. We camped at Barren River State Resort Park in a Motorhome. The best thing about this park was the camp host. Someone had taken our spot and then left for the day. She took us around to select any other open spot that we wanted. She was so friendly and accommodating, she made the best of a crummy situation. Still, I had quite a hike to the laundry room since all the machines at the close one were broken. Also, the dumpster was overflowing and someone cleaned fish on newspaper and just tossed it in without a plastic bag. Maybe the problem is not the management, maybe it is the clientele. 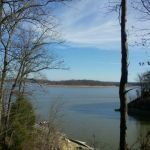 We camped at Barren River State Resort Park in a Travel Trailer. This was one of the worst campgrounds I have stayed at. The grass wasn't mowed, the fire pits were in an unsafe condition, with metal sticking out of the ground. No ventilation in the shower house. RV hookups were on opposite sides. Power on one side of RV and water on the other side. Had to use a long garden hose to reach water spigot. I would not recommend anyone staying at this park. If you have a long motor home, you will drive through the grass several times to get in and out. Attendants at the front gate were no help at all. They were like "yeah yeah, we understand". Pitiful place to stay. Should have demanded a refund. We camped at Barren River State Resort Park in a Motorhome. Came in on a Wednesday and the park was mostly empty. Weekends are full! Friendly staff that sell ice and firewood at the front entrance. Paved pull through spot for our 30ft TT. On a hill but easy to level. Picnic table and campfire ring at each site. Plenty of room between the sites with large shade trees and grass. Water and electric on opposite ends of the site so we had to have an extension cord for the electric - no problems. No wifi or cable but Verizon Mifi picked up the internet with a booster. AT&T didn't work well. Nicely maintained State Park. Two Bath houses cleaned almost daily, plenty of hot water, hooks for clothes and the lights run on timers. Laundry with 1 washer and 2 dryers at each bath house (One set wasn't working). Dump stations behind each one. Turns are a little challenging and there are several spots where the pavement needs repair. The sites on the outside of the loops are very small and should be for tents only. We stayed for 2 weeks on one site and then moved to another for 2 more weeks. We loved this park and plan to return! We camped at Barren River State Resort Park in a Travel Trailer. Many things to do within a mile of the campground but still within the park. Horseback riding, beach, walking trails, golf course, restaurant, marina, boat rentals and playground for kids. Walmart, Lowe's, grocery stores and restaurants within 15 minute drive. We stayed in our class c motorhome in site 23 with friends in 21 (early April 2016). For the first part of our stay we had no other campers in our circle which was nice. Restrooms were clean. Sites are short and hilly. Our sites had water/electric; however the water is shared on ALL sites so one site will have hose running thru the 'living' section of your campsite (bring long hoses). Most sites are extremely unlevel or with steep drop offs to one side of pad and/or towards fire ring (sites 21/23 were fine though). Water was 'chalky'...very questionable. I would recommend filling your fresh water tank from home. Can hear road noise (not as bad in our loop). Most state park activities weren't open during our stay since it was early spring (was fine since we drove to Mammoth Cave for tours). 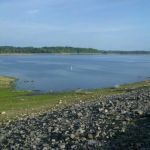 We camped at Barren River State Resort Park in a Motorhome. We were able to get a spot with a lake view close to the boat ramp. Slideout/awning friendly level sites are few and far between in the lower section by the lake, however. Water and electric are spaced apart from each other and we had to choose which one as our 50' water hose was not enough. Very hilly (not bicycle friendly) but that's to be expected so close to a lake. The restrooms were clean but dingy. We had no problem getting our 34' trailer around the grounds. No pool and no playground (that we could find anyway.) Hardly a flat area to throw ball or Frisbee even. It was not awful but we will not return. not what I was expecting for a state owned park. Disappointed. We camped at Barren River State Resort Park in a Travel Trailer. Very narrow paved roads lead to very narrow paved sites that are seriously off-level. Narrow grassy areas between sites provide no privacy. Some electric hook-ups were inadequate but sites are close enough together that hooking to the neighboring electric may be possible though inappropriate (a neighbor was using ours when we arrived). AT&T phone and data service were weak but serviceable in the area. We camped at Barren River State Resort Park in a Fifth Wheel. Great pull-through site. Nice clean park. Great fishing and boating. Near Mammoth Caves, the Corvette plant and museum in Bowling Green and Lincoln's Birth Place. We camped at Barren River State Resort Park in a Fifth Wheel. Nice campground; friendly hosts and good food at the lodge. We camped at Barren River State Resort Park in a Fifth Wheel. Nice campground in one of Kentucky's State Resort parks. The campground is a nice, clean campground with mostly level parking spots. This campground is located on a hill though and is not a bike friendly campground. Most of the roads throughout the campground are pretty hilly. Some campsites are on a pretty good incline. Good TV and cell phone reception. Bath houses are nice and pretty clean, plenty of hot water. As with the KY resort parks, there is a lodge here with a nice restaurant. There is a pool at the lodge, but it is for lodge guests only. However nobody checks and campers can swim here. Laundry machines are available for use. Did not see any vending machines or payphone. There is a swimming beach a short drive from the campground on the park premises. Horse riding available as well. $18 per person for 45 minutes. Hiking and biking trails as well. 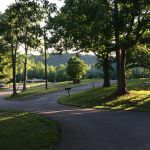 We camped at Barren River State Resort Park in a Travel Trailer. We stayed at Barren River State Park while we were visiting Mammoth Cave. There is a nice lodge, golf course and horseback riding available. We did not use any of these services. One word of advice. Be really careful of the site you select. Most of the sites are very unlevel with difficult grades. Some would not accommodate a large rig. We have a 39' 5th wheel and were on one of the more level sites, but it was a chore to get it leveled. The RV section has a laundry but only one machine was working. We did not use the bathhouse. There are no full hookups but it is very shady. Each site has a fire pit and picnic table. Some of the turns were very tight. We camped at Barren River State Resort Park in a Fifth Wheel. The park has both pull-through sites and back-ins. The good news on the pull-through locations: They are long! The bad news on the pull-throughs: Although paved, they are not level. In fact, the slots are very much "humped" in a small hill. I had to move five times before I found one that did not stress out my hydraulic levelers. Further, the pull-through sites have only partial shade. The back-ins are more shady and appear fairly level, but will only accommodate small (30 foot or less) RV's. The rate I am showing reflects a AAA Motor Club discount (which I was surprised the park accepts!). The full rates are $19 for weekdays, $21 for weekends. I was surprised to find that this state park has laundry machines. I believe this is unusual for a state park. However, the laundry machines were outside under a cover that could be pulled down when they are not in use, so the laundry facilities were a little dirty. Restrooms were so so, I would wear shower shoes. We camped at Barren River State Resort Park in a Motorhome. This campground is quite old and has not been updated since we were here 25 years ago. The area is great with lots of activities for kids and with beach and marina nearby. The bathhouses were in deplorable condition and did not appear to have been cleaned in several days. Fire rings had ashes from previous occupants as well as lots of trash, cigarette butts, and beer bottle caps. If you are going to stay in this area, I would recommend the COE campground at Narrows. We camped at Barren River State Resort Park in a Fifth Wheel. Are you affiliated with Barren River State Resort Park ?